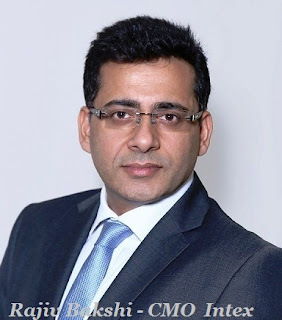 In line with the company's continued efforts to strengthen and professionalise management to accomplish accelerated growth, Intex Technologies, one of the leading Indian Mobile & Consumer Electronics companies, has appointed dynamic industry leader Mr.Rajiv Bakshi as its Chief Marketing Officer (CMO). An alumnus of the Harvard Business School, Mr.Rajiv Bakshi has a distinguished reputation of spearheading Strategic Brand Development, Business Transformation, Consumer Acquisition and Digital Strategy to drive long term growth and profitability. As the CMO, he will envision Intex’s Go-To-Market Strategy for the entire range of Mobile & Consumer Durables, spread across 25+ product verticals including Feature & Smartphones, LED TVs, ACs, Washing Machines, Speakers, Headphones and Accessories. Mr. Bakshi will lead the generation of consumer insights for incisive product development and planning, augment Sales and Distribution network across the General Trade, E-Commerce Portals, Large Format Stores and Company Branded 100 plus Retail network. Additionally, he will pioneer the Digital Strategy and boost international operations. Prior to Intex, Mr. Rajiv Bakshi had a successful 13-year stint at Discovery Networks India & South Asia region, as the VP & Head of Marketing & Products. He expanded the company’s portfolio from a single TV channel to 11 high performing channels, garnered 10-year long undisputed leadership for Discovery Channel; pioneered India’s first lifestyle channel TLC; created a differentiated kids’ network for the 300 million children under 14 years of age - Discovery Kids and conceived the country’s first High Definition channel targeting affluent Indian consumer. He strategized Discovery’s localization initiatives: launched regional products for the South & East India, hundreds of hours of content from Bollywood to Animation and Movies and Digital transformation for customer acquisitions, engagement and product development. Mr. Bakshi has been conferred with multiple recognitions including the “Marketing Professional of the Year” and is a distinct jury member of multiple Creative and Marketing awards across India and Asia. Earlier in his career, he consulted in the FMCG, Auto, Internet, Financial, Media and Durable industries.